There were probably 15 or so Patriots here. Steve Pearce was very pleased. They've had plenty of practice. But the Sox know how to put on a ceremony, that's for sure. 92, 93, 94 for Sale on his first three fastballs. Baseline velo was at what had been his peak in prior two starts. Sale 92-94 out of the chute. 23 Patriots on hand per Mr. Reiss. In the top of the third, Galvis singled to right, Hanson scored to trim the Red Sox lead to 2-1, and McKinney to third. Hernández then hit a sacrifice fly to center fielder Bradley Jr., and McKinney scored, tying it up at 2-2. In the top of the fourth, Gurriel Jr. singled to right, Jansen advanced to second, and Grichuk scored to give the Blue Jays a 3-2 lead. Sale retired the first seven batters he faced. Six of the next eight have had singles. Lourdes Gurriel Jr. stole home on Sale and Christian Vazquez. Boos at Fenway at the Jays take a 5-2 lead. Seven of the last 11 Jays have reached and two of the outs were sacrifices. Still in the top of the fourth, Jansen scored on Vázquez’s passed ball, and Gurriel Jr. advanced to third, giving the Jays a 4-2 lead. Then, Gurriel Jr. stole home to make it 5-2, Blue Jays. Jays manager Charlie Montoyo was lamenting his team's lack off offense before the game, too. Sunday's win and today's pre-game ceremony didn't give the Sox much of a lift it seems. In the bottom of the sixth, Betts homered to make it 5-3 Blue Jays. Three batters later, Bogaerts walked, bringing Devers to the plate. 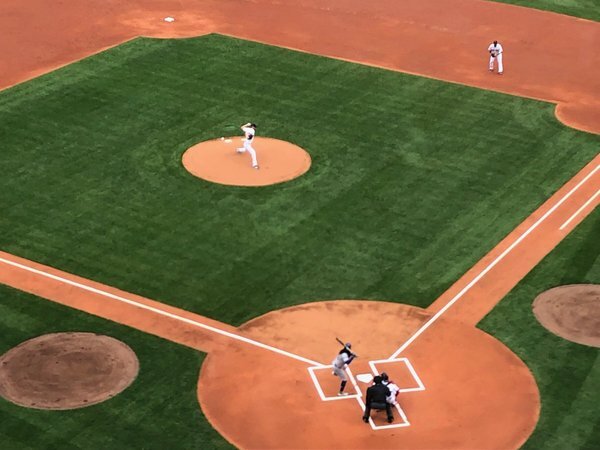 Thanks to a fielding error by left fielder Hernández, Devers was safe at second and Bogaerts scored, trimming Toronto's lead to 5-4. Tough at-bat for Devers, but he remains without an RBI this season. Leaves Bogaerts at second. Sox now 3-9 and will be six out of the Rays hold on. Since the introduction of the wild card in 1995, 57 teams prior to this year got off to 3-9 starts or worse. Of those, three (5.6%) made the playoffs.